“Today wasn’t the best day, it was the best-best day! I liked all the games we played this week. Being out here is much better than playing on my PlayStation 4”. This is how Randall summed up his time at YMCA St Paul’s Group’s Woodland Activities Summer Playscheme on the last day, a Thursday in August. 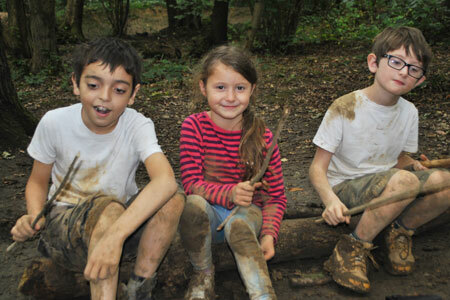 All the other children agreed: The last week had been magical – and muddy. Elliot and Harvey however, also said they really liked making the camp fire, and also crafting bows and arrows from branches they had found in the forest. Eliza on the other hand, said she enjoyed “everything” at the playscheme, and so did Sam. New this summer, this YMCA LSW holiday playscheme located in the ’60 Acre Forest’ in Chessington included just as many small and big adventures as the more well-known adventure park next door. But instead of rides and carousels, at the Woodland Activities children aged 5 to 11 took part in shelter building, camp fire building and outdoor cooking. They played games that encouraged them to use their imagination, such as ‘Eagle eye’ – a forest version of hide and seek – and they learnt to handle tools like axes and knives, and to care for plants and animals that live in the forest, as well as for each other. With the children engaging in challenging and ‘risky’ play like fire building and working with wood, YMCA St Paul’s Group makes sure all the staff members are carefully trained at delivering this type of playscheme. “The woods provide children with the freedoms to play intrinsically; with each other or to immerse themselves in their own imaginations. I love to watch children first arrive in the woods, with a little apprehension at first to then observing the transformation to being inspired by the woods,” he says. With a passion for providing children with opportunities to play and learn in the great outdoors, Victoria Workman, who runs the Breakfast Club at YMCA Hawker in Kingston, fully believes in the Woodland Activities ethos. She adds that “Woodland Activities are all about allowing the children to freely access the great outdoors, allowing them to exploring and maintain curiosity in the world around them. Noah was one of many children clearly not too happy about having to pack up the camp and leave after one final round of ‘Eagle eye’ when the playscheme finished mid-August. “Normally, it’s challenging getting them to play outdoors, but at this playscheme they are out all day and that’s really good for them. It’s good for them to be challenged, and to be physically active. When they came home on the first day of the playscheme, their legs were hurting after having used muscles they don’t normally use. I think that’s really great and I will definitely send them back” she said.